Powerful microscope mounted to produce microelectrodes for patch clamping. In patch clamping, contact is made between the electrode and the cell membrane to measure cell potential, without damaging the cell membrane. This microforge assists the process by using fire-polishing technology to polish the microelectrode tips. 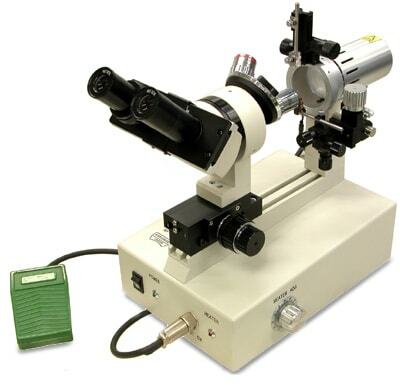 A powerful microscope (525× total magnification) is included for making electrodes with tips less than 2µm. Independent, easy-to-operate manipulators are provided for both heater and electrode. A fine movement unit on the side of the heater moves vertically to bring the heater closer to the tip even under high magnifications. The heater is made smaller so as not to get in the way and is turned ON/OFF with a foot switch. The electrode holder is in the form of a leaf spring, which is easy to detach/attach, and the narrower operating area facilitates ease of use.